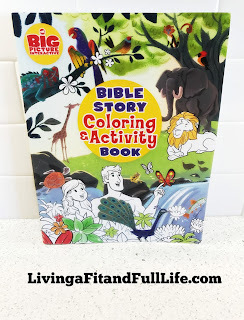 Living a Fit and Full Life: The Bible Story Coloring and Activity Book for Kids is Hours and Hours of Fun! The Bible Story Coloring and Activity Book for Kids is Hours and Hours of Fun! Filled with more than 200 coloring pages and more than 150 activity pages for young children, this Bible Story Coloring and Activity Book from The Big Picture Interactive provides hours of fun. The Bible Story Coloring and Activity Book for Kids is Hours and Hours of Fun! First of all, I have to say I love how clean, white and bright the pages are in this coloring book. I also really like that they seem to be a bit thicker than your traditional coloring book making it easier to use markers without bleed through. The Bible Story Coloring and Activity Book for Kids is filled with more than 200 coloring pages and more than 150 activity pages for young children that are an absolute blast. 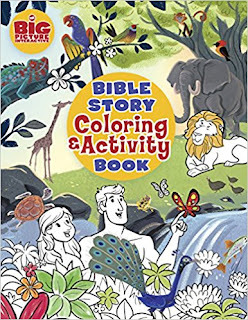 The Bible Story Coloring and Activity Book for Kids is the perfect way to keep kids busy this summer, whether your beating the heat indoors, lounging by the pool or going on a road trip. The Bible Story Coloring and Activity Book for Kids will keep the kiddos engaged and entertained. It's the perfect cure to summer boredom! 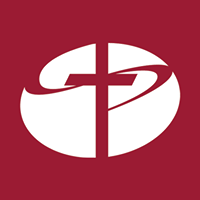 You can find Bible Story Coloring and Activity Book on Amazon, Lifeway and other bookstores.